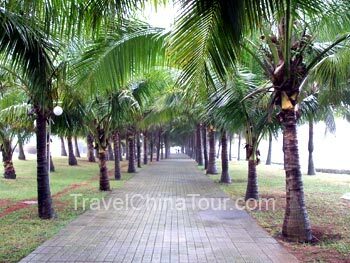 Located in the central part of Binghai Street in Haikou, the Evergreen Park covers an area of 1070 acres. 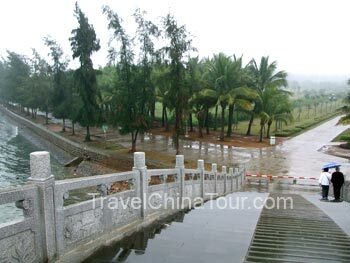 The park is filled with tropical plants and trees, and is currently the largest tropical scenery park in Haikou city. It is one of the most popular parks for the local people to gather and enjoy beautiful scenery. According to the park, there are tens of thousands of coconut tress planted within the park, making it a tropical paradise surrounded by blue skies and ocean waves. 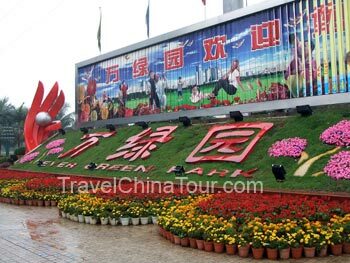 The Evergreen Park is known by all Haikou residents, and it's safe to say that most if not all Haikou residents have been to Evergreen Park. The Evergreen Park was part of the Haikou city's efforts to make the city more environmental friendly, and more "green", which began in 1994. Of the $30 million investment needed for phase one, $10 million was donated by Haikou people. It's reported that the land the Evergreen Park occupies could fetch a price of over $6billion RMB, and it was a contentious issue to whether sell the land for profit or develop it into the evergreen park. Of course, it was eventually developed into the Evergreen Park. The Evergreen park is free to enter, and there is no entrance fee. It serves mainly as a place where locals can go for walks, take part in community exercises, and to enjoy leisure activities. Located right by the ocean, you can hear the waves smash against the shoreline, and feel the windy ocean breeze. The first day we were in Haikou, it was a rainy day, so there weren’t many people walking around, and the park was quite empty. Despite the gloomy day, a walk in this enormous tropical park was very pleasant, and relaxing. Everywhere we went, we were greeted by green plants and tropical trees. Palm trees lined up along the path to which you don't see an end. A stone bridge over the water channel leading into the ocean.